The Bondurant Condos. 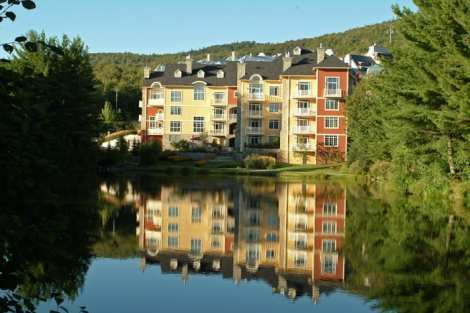 Luxury comfort and spacious accommodations in the centre of Mont Tremblant. In the heart of the action! When it comes to comfort and spacious accommodations in the centre of it all, Bondurant is the answer. When it comes to comfort and spacious accommodations in the centre of it all, Bondurant is the answer. Nestled in the heart of Mont Tremblant’s legendary pedestrian village and overlooking the tranquillity of Lac Miroir, Le Bondurant effortlessly combines luxury accommodations with the fun and excitement of Eastern North America’s #1 ski resort outside your door. Have a taste for the finer things in life? Le Bondurant delivers with individual and uniquely furnished accommodations in a luxury setting. Ideally located in the heart of the pedestrian village. 50% is required upon booking; the balance is due no later than 1 month prior to arrival. Wire transfer, Visa, Master Card. A security deposit will be taken by credit card Visa or Master Card. No smoking, no pet, maximum 6 people, no reservation for people under 25. Absolutely no loud music or behavior, disrespect of neighbors, or excessive number of cars will be tolerated.